Manila (VNA) – Foreign Minister Pham Binh Minh has appealed to the Association of Southeast Asian Nations (ASEAN) to intensify exchanges with China to soon start pragmatic negotiations of the Code of Conduct in the East Sea (COC), making it effective and legally binding. He was addressing the ongoing 50th ASEAN Foreign Ministers’ Meeting (AMM 50) in Manila, the Philippines on August 5. 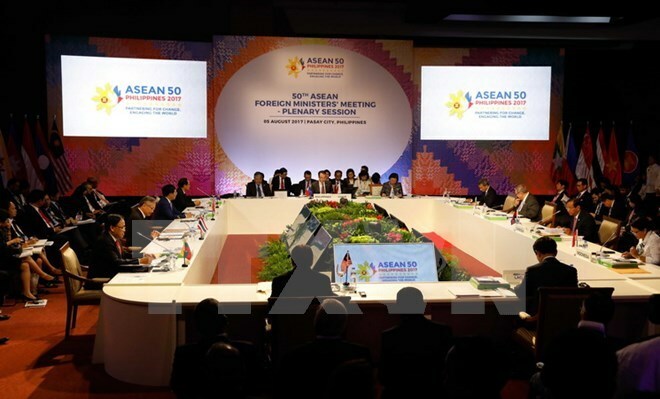 The ASEAN foreign ministers on August 5 reached a consensus on a draft framework for a code of conduct (COC) of parties in the East Sea. The draft is expected to be submitted to the ASEAN-China Foreign Ministers’ Meeting for approval on August 6. Minh applauded ASEAN and China for their full implementation of the Declaration on the Conduct of Parties in the East Sea (DOC). Vietnam’s viewpoints were echoed by other countries, which emphasised the importance of solidarity and unity, ASEAN’s centrality in the present context, and especially basic principles of international law, including the UNCLOS. They held that it is necessary to effectively and pragmatically contribute to maintaining peace and stability by exercising restraint, building trust, and especially avoiding actions that can harm regional peace and stability such as reclamation and militarisation of entities at sea. The participating FMs expressed their concerns over challenges to regional security, both traditional and non-traditional, including the increase of terrorism and piracy, the situation in the Korean Peninsula and the East Sea. Given the regional and global backdrop, they pledged to intensify efforts for dialogue and cooperation, step up the building and sharing of codes of conduct in relations between countries in the region, and raise ASEAN’s self-reliance in dealing with such challenges. Vietnam will work together with other ASEAN members to strengthen comprehensive cooperation within regional mechanisms and frameworks in order to cope with the problems, he stated.